The service entrance is the equipment that brings electrical power to the home. Most residential service includes three wires: two cables carrying 120 volts each (for a total of 240 volts) and one grounded neutral wire. If the cables are hung overhead, they are collectively called a service drop. If they are routed underground, they are known as a service lateral. 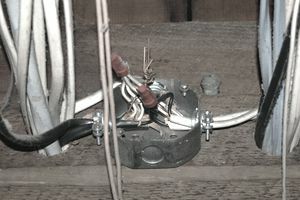 A service drop connects to the home at a service head, or weather head, on the roof or exterior wall of the house. Once the power reaches the house via the service drop or service lateral cables, it passes through the electric meter, which may be mounted on an exterior wall or may be located inside the home's breaker box. The meter records all electricity used by the home, measured in kilowatt-hours, or kWh. A 100-watt light bulb burning for 10 hours uses 1 kWh of electricity. Meters may be analog or digital type, although most new meters are digital and can be read remotely by the utility company. The main service panel, commonly known as the breaker box or circuit breaker panel, distributes power to all circuits throughout the building. Each circuit has a breaker that can shut itself off in the event of a short circuit or overload to cut power to the circuit. Old homes may have fuses instead of breakers. Fuses are just as effective as breakers, but most new panels today use breakers instead of fuses. It is important to note that power coming from the service lines to the electric meter, and then to the main service panel, is always live. Before working on these areas the power company must shut off the power. The power going out of the panel to the household circuits can be shut off by the main breaker in the service panel, but the power coming into the panel is not affected by the main breaker. An electrical box is a plastic or metal box used to connect wires and install devices such as switches, receptacles (outlets), and fixtures. An electrical box is almost always required for mounting devices and for housing wiring splices. Boxes come in many different sizes and several different shapes. A box must be sized appropriately for the number and size of wires entering the box. Metal electrical boxes must be grounded to the home's grounding system; plastic boxes do not need grounding because they are nonconductive. Each electrical circuit contains at least one "hot" wire that carries the electrical current from the service panel to the circuit devices and a neutral wire that carries current back to the service panel. Hot wires typically are black or red but can be other colors. Neutral wires typically are white. In some circuits, the neutral wire is used as a hot wire and the circuit has no dedicated neutral. An electrical ground is a safety system that provides a safe path for electricity to follow in the event of a short circuit, electrical surge, or other safety or fire hazard. In modern home wiring systems, each circuit has its own ground wire that leads back to the service panel. After the panel, the ground system terminates at a ground rod driven into soil or to another ground conductor where electricity is safely dissipated into the earth. Older homes may have ground systems that rely on metal electrical boxes, metal conduit (which houses wiring), and metal water pipes.